A guide for parents in Chapel Hill, Carrboro, Raleigh, Durham, and surrounding areas. 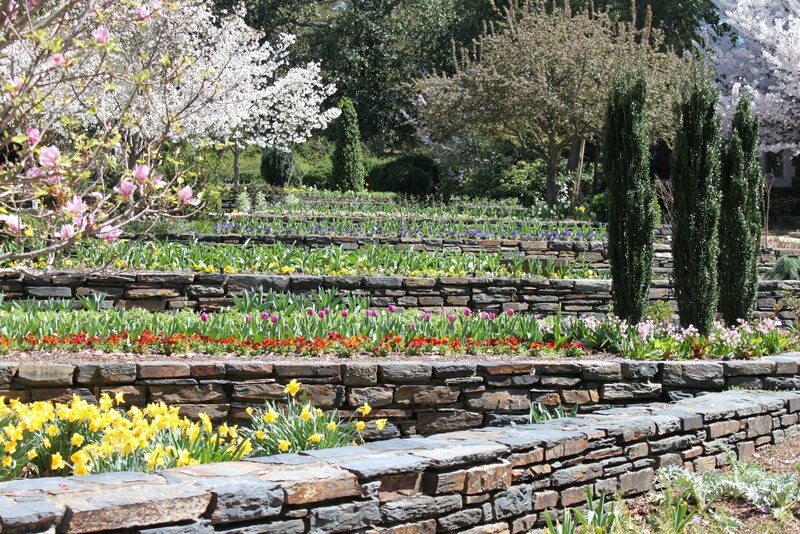 Stop here to plan your next kid-friendly activity out in the Triangle. Updated 1/2012: LFF in Apex has closed its doors and is now a Liftetime Fitness. C'est la vie. So how cool is THIS idea!? Starting in April, Lifestyle Family Fitness in Apex is offering a Family Fit class. "A combination class for parents and kids 5 and up. The end result: getting fit and having fun together. The “instructor choice” class includes moves from yoga, dance and athletic conditioning so that all of our senses are brought into play. Be hip, be strong and be calm – all in one class!" The classes rotate each week between Dance and Athletic Conditioning. It's at 4:30 on Thursday evenings. I am not sure whether or not you have to be a member of the gym to attend, so please give them a call (I even provide the number below, so no excuses!). As a gym rat, I think this is a fantastic idea! Too bad C is way too young for this right now. C loves to go for walks. He is an outdoor kid (I see Boy Scouts in the future). We get outside at least once a day to go for a walk and, as a stir crazy mom, I have been trying to use that time to get out and explore somewhere new. 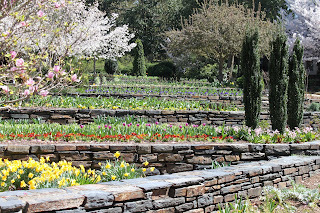 So one of the first beautiful spring days we did a playdate in the Duke Gardens. It was fantastic! We picnicked on some green grass near the Visitor Center, not knowing that there were lawns further down also open for picnicking. But it didn't matter-- we loved our location and no one cared. Even better, free admission (although you do have to pay for parking and a map). The Visitor Center offers programs for kids throughout the month, but we have yet to try one of those! 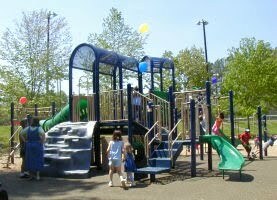 Wilson Park is located in Carrboro on Williams Street (which intersects with Greensboro near Estes Drive). We took C there since we were looking for "baby swings," which Wilson Park has and, it turns out, C hates. We're not giving up though! This park was great-- large enough to hold a lot of kids on one of the first beautiful spring days without feeling crowded. The play equipment was huge and nice, but, of course, a little too big for C just yet. The children on it, though, seemed to be loving it. Besides the one large playgym, there were also a few other smaller areas for children to play, one which catered to the smaller ones. There is a lot of sand around and under the play gyms, but C didn't mind that. It was actually fun to watch him explore the new texture. There was a lot of space available for picnicking (which we saw some friends doing!) as well. Shade was available for picnicking, but not a lot of cover over the play areas. Parking is easy at this park, too. You love your canine because it was your first baby. But now baby no. 2 is coming home and Fido needs to be prepared to get a little less attention (although not less love). Our dog is a rambunctious, fun-loving, high energy mutt. We couldn't love her more, even if she does drive us batty sometimes. I took her in for her annual check up at our awesome vet (Timberlyne Animal Clinic) and we got to talking adjustment with the baby. Our vet gave us the name and number of a dog trainer (below) who's specialty is getting dogs acclimated to new family members. We determined, with our vet, that our mutt is fine, but I really think that this information is smart to use if there is any possible issue. Don't chance it, call in help! You love both your babies, so help them love each other, too. I could eat pizza at any time of day for every meal of the day....I love it. That's why I am so happy that Brixx in Meadowmont is so kid friendly (and also why I work out so much)! C and I met my husband there for lunch one weekday afternoon, and the staff was so courteous and nice to C that it made dining there pleasant. Not to mention that the pizza was delish! After we confiscated the crayons our host put on the table, our waiter brought C some pizza dough to play with. So funny! He had such a fun time playing with the sticky consistency. And that is something I never would have thought of doing. There is also outdoor dining at Brixx, which is quite lovely during the warm spring days. The only problem? 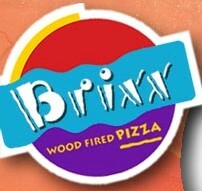 Brixx was definitely "discovered" long ago. So it can be tough to get in and get a table. The place is noisy but, with a toddler, I actually don't mind that. Makes me feel like the squeals are just contributing to the ambiance, not detracting from it. I think that Kids Exchange is the biggest consignment sale to hit our area each year (I haven't been), but Kids Everywear is nothing to scoff at either. Kids Everywear is offered twice a year. This spring they held their sale at the Morrisville Outlets. I ended up going the last day of the 4-day sale. And even though a lot of stuff had already cleared their shelves, I was floored by how much was still there. For so cheap, too! Each day of the sale, the items get cheaper and cheaper. So if there isn't anything specific you need and you are just looking for a good deal, head over there at the end. I got an old school Fisher Price telephone for C for 54 cents. It is his favorite toy. If there is something specific you are looking for (pack n plays, strollers, cribs, high chairs, etc.) then I suggest you go as early as possible. Those items move quickly. And are still a bargain. Kids Everywear also offers early shopping to first time moms and pregnant moms (you have to register in advance online), volunteers, and consignors. I don't know if they have announced the next dates yet. But stay tuned to the Internet. I am not sure how cosigning your stuff would work, but I am interested in trying that out, too, since we also have a lot of toys that we could part with! Tis the Season! 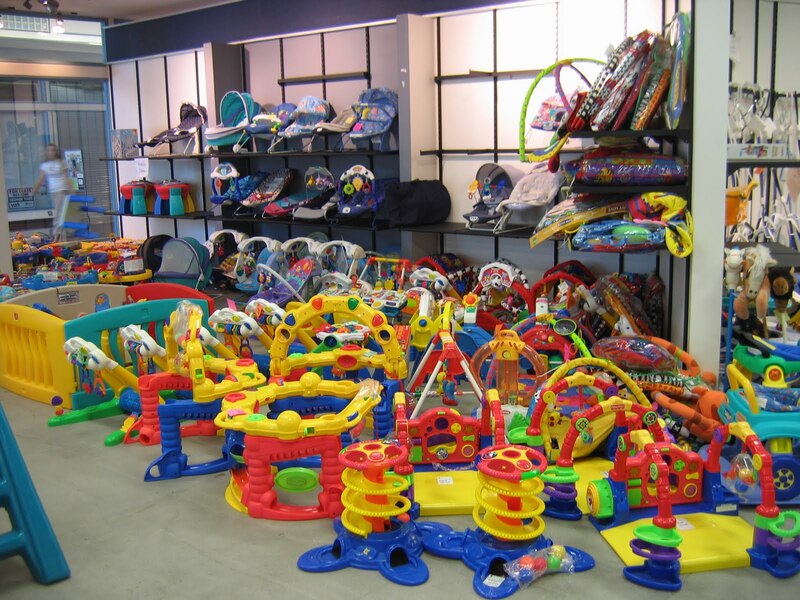 February through May is the high season for consignment fairs. Find the one you want, and get to wheeling and dealing. 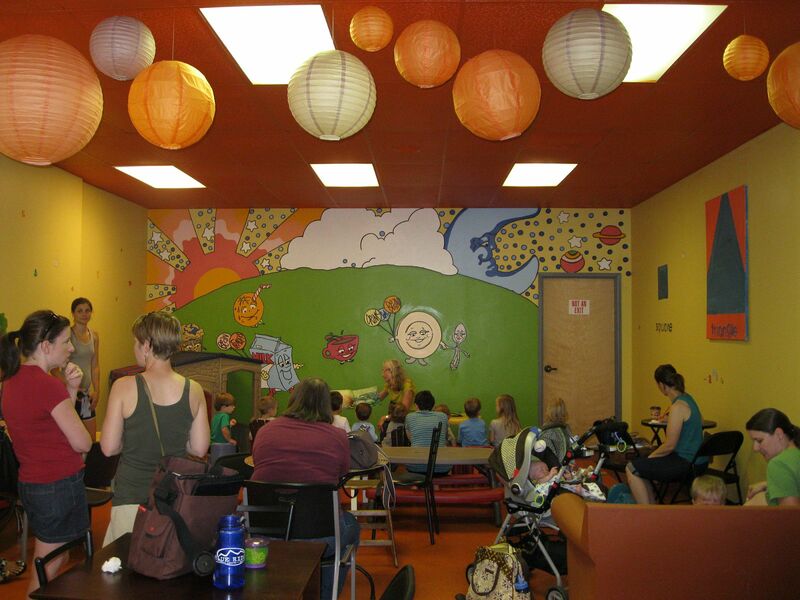 Updated 5/2011: Bean Traders has bought new furniture, cleaned up the kids' area, and opened it up. It is so nice; I love it! The only downside is they also removed the old barrier between the kids' area and the rest of the place. But that's ok. The toys and little house keep them well-occupied. You know I love when businesses caters to moms. So my mommies group and I were excited to try out Bean Traders off of 54. 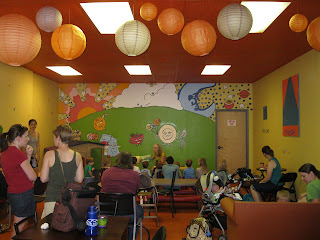 We had read on a sister blog (stircrazymomsofdurham.blogspot.com) that they have an area set up for kids. After some food at the Greek place next door, we went to get coffee. Bean Traders has great coffee, by the way, and great service. And it's local. So it's a good place to go without kids. But with kids, it was fun, too! There was a plastic house set up, a few foam pads, kiddie-sized tables and chairs, and some other pieces for children to crawl on. Great idea! Although, I have to say, I am not a germ-a-phob in the least, but I felt gross about this. Nearly all the babies we took were in crawling mode. And to see a baby on his hands and knees crawling on a very nasty floor amongst smashed up scones is a little disconcerting. A friend of mine has gone back since our first visit, though, and says that it was much cleaner. I reiterate, great idea and I would say go and enjoy the delicious coffee. Just bring your Antibacterial Wipes. And for goodness' sakes, don't let your child put anything in her mouth that is on that floor. I love taking C to the pool. He has so much fun. And I also think that getting kids accustomed to water at a young age takes the fear out of it later. I am fortunate to live in an area with a beautiful, new, public INDOOR (yes, heated!) pool. The Homestead Pool in Chapel Hill is a wonderful asset you should definitely use for your mommy outings. It is big, pretty, warm, has a wade-in entry, and has lifeguards on duty. C and I have been a few times (once we had to evacuate since a kid's birthday party was also being held there and those kids did NOT obey the "wait 20 mins. after eating to swim" rule). Each time we have had fun. There is a small fee to get in, and it varies depending on whether or not you are a resident of the county (honor code). Note that the locker rooms aren't all that family friendly. Small and cramped. So plan to do as little changing there as possible.